6 killed as IDF retaliates in Gaza following massive barrage of rocket fire on Israel, including terrorist killed infiltrating into Israel. A terrorist operating out of the Hamas-controlled Gaza Strip was killed Tuesday morning, after an Israel Air Force aircraft opened fire on a terror cell involved in launching rockets at southern Israel. A second terrorist was killed Tuesday morning after he infiltrated into Israeli territory and damaged the Israeli security fence on the Gaza border. 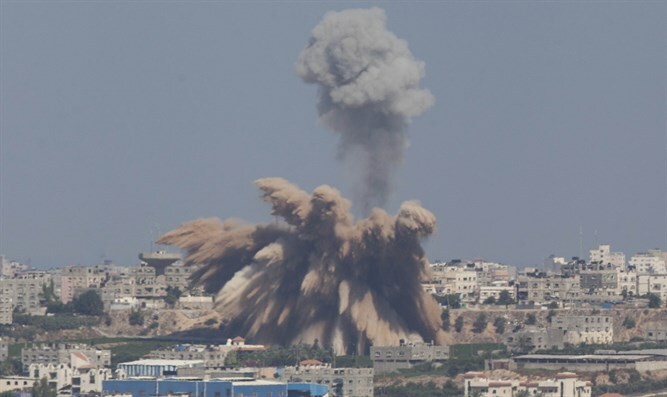 Gaza health officials identified the terrorist killed in the airstrike as 26-year-old Khaled al-Sultan. A second terrorist was reportedly injured in the airstrike, which hit the rocket-launching cell in the northern Gaza Strip. Two terrorists from Gaza managed to infiltrate into Israeli territory Tuesday morning and damage the Israeli security fence. The pair then attempted to flee back to Gaza. An IDF spokesperson said an Israeli attack helicopter and Israeli aircraft fired towards the infiltrators. "A short while ago, IDF troops spotted several suspects crossing the security fence from the northern Gaza Strip, infiltrating into Israeli territory. In response, an IDF attack helicopter and an IDF aircraft fired towards the suspects. IDF troops monitored the incident from the start." Health department officials in Gaza later said one of the two terrorists was killed by Israeli fire. The terrorist was identified as 20-year-old Mossaab Hus.